Quick and clean with gas? Or slow and smoky with charcoal? That’s the question backyard grill masters have been hotly debating since the first gas grill in the 1960s. Here’s another option: Why not get down and dirty, and clinch that rib-eye to crusty perfection? 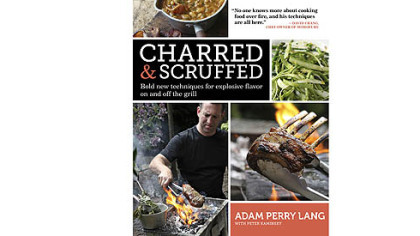 Clinching — cooking meat directly on hot coals — is one of the more unusual cooking methods grilling guru Adam Perry Lang explores in his latest cookbook, “Charred & Scruffed: Bold New Techniques for Explosive Flavor On and Off the Grill” (Artisan, May 2012, $24.95). It’s a hard-core approach that’s guaranteed to elicit oohs, aahs and the occasional ewws from those who think ash on meat is yucky. Yet it actually makes for a pretty good steak dinner, in that cooking meat directly on white-hot coals creates a charred, smoky and, yes, slightly ashy, crust that is tough to replicate using traditional means. Cooking on coals usually is referred to as “dirty grilling,” for obvious reasons. Mr. Perry Lang has reinterpreted it as clinching, a boxing term for a defensive move in which a boxer captures his or her opponents’ arms under his own, and holds on to prevent the opposition from punching. 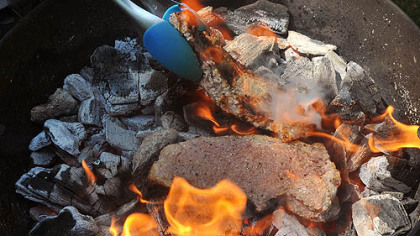 When a moist steak hits sizzling hot coals, it similarly will hang on for dear life. The chef prepares the coals for cooking by making an even cooking surface — using a cast-iron skillet to lightly tamp them down to a uniform height of 4 to 6 inches. Then, just before placing the meat on the coals, he or she uses a hair dryer to gently blow away any bits of ash. If your extension cord doesn’t reach into the backyard, or you think it’s goofy, you also could fan the coals with a piece of cardboard. Julia Child, so famous for her sophisticated French cuisine, also was known to occasionally get dirty. She demonstrated “dirty steak” with a 3-pound rib-eye roast on the PBS series “In Julia’s Kitchen Cooking with Master Chefs.” In that 1996 episode, the husband/wife culinary team of Johanne Killeen and George Germon also prepare a “hot fanny” sauce, a spicy-sweet barbecue sauce made with caramelized onions, jalapeno and chicken stock. If the queen of traditional cooking can take a walk on the wild side, so can you. Clinching is best suited to cuts with a smoother muscle surface, such as New York strip or rump, that are cooked to rare or medium rare. But you also can use the technique on English-cut lamb chops, boneless pork chops and tenderloin roast. Ditto with chicken: Mr. Perry Lang offers a terrific recipe for Clinched Chicken Wingettes that includes a brine, butter baste and one of the saltiest (but delicious) seasoning rubs I’ve ever tasted. To prepare dirty steak, you’ll need lump charcoal, which is made from big chunks of hardwood. (Briquettes are made from compressed coal dust, sawdust and other wood by-products, with a binder and other additives.) It’s best to start the fire with a chimney starter instead of lighter fluid so there are no off-putting flavors. Also, make sure the coals are white-hot before cooking; any flames and there could be flare-up. Don’t freak out if the coals stick to the meat when you flip them, as they easily shake off. And if you can’t get past the thought of ash on your food? Simply place a thin grill or grate directly on the coals. Everyone agreed this was about the best steak they’d ever tasted, despite the tiny bit of ash that stuck to the meat. And what a feast for the nose. It smelled so good, my mailman wandered into the backyard to see what I was cooking. I was probably a little too generous with the seasoning blend (it’s extremely salty), but the resulting crust was to-die-for. Remember to use tongs for turning. A fork will pierce the meat and let the juices run out. Bring refrigerated steaks to room temperature for approximately 1 hour. Prepare a “mature and level” coal bed, with a clean thin grate or rack set over it if you like; the fire should be very hot. Fan or blow-dry excess ash from the coal fire. Using the herb brush, brush steaks lightly with Butter Baste. Put them on the grill grate or directly on the coals and cook, without moving them, for 2 minutes. Turn steaks, baste lightly and cook for 2 minutes, then repeat 2 more times, basting the steaks each time they are flipped. Lean steaks up against one another; on their sides, fat side down, and cook for 1 minute. Repeat on the other side, until the steaks reach an internal temperature of 110 to 115 degrees. Meanwhile, pour the Board Dressing onto a cutting board (or mix it directly on the board). Finely chop the tip of the herb brush and mix the herbs into the dressing. Transfer steaks to cutting board and turn them in the dressing to coat. Allow coated meat to rest for 5 minutes. To serve, slice steaks 1/2 inch thick, turn each slice in the dressing to coat, and arrange on plates. Pour some of the board juices over each serving and finish with a sprinkling of salt. A little bit of this blend goes a long way. Combine all ingredients in a small bowl. Transfer to a spice grinder or clean coffee grinder and pulse to the consistency of sand. Store in an airtight container for up to 1 month. Definitely not kind to your waist, but incredibly flavorful. Combine all ingredients in a small saucepan and heat over medium heat until butter melts, then bring just to a simmer and simmer gently for 2 to 4 minutes. Let stand for at least 1 hour to let flavors meld. You can improvise this recipe by adding your favorite chopped herbs (such as rosemary, thyme or sage) or scallions or mixing in grated shallots or garlic (use a Microplane). For a little fire, add finely chopped chiles. Combine olive oil and parsley and season to taste with salt and pepper. If using, add shallots, garlic, etc. Make sure the coals are absolutely white or you’re guaranteed a flare-up. Even with blackened skin, the wings won my kids’ approval. Put the wings in a large heavy-duty plastic bag or medium bowl and add the brine. Seal bag or cover bowl and refrigerate at least 12 hours, and up to 16 hours. Drain wings (discard brine) and pat lightly dry with paper towels. Allow to come to room temperature, approximately 30 minutes. Prepare a “mature and level” coal bed, with a clean thin grate or rack set over it if desired; the fire should be very hot. Toss wings with Butter Baste in a large bowl and arrange in a single layer in a grill basket; reserve Butter Baste in the bowl. Put basket on the grill grate or directly on coals and cook for 3 minutes. Turn basket, baste the wings with the herb brush, and cook for 3 minutes, then repeat 2 more times, basting each time the basket is flipped. Transfer basket to a platter and allow wings (still inside) to rest for 5 minutes. Put basket back on grill grate or coals and cook for 2 minutes, then flip over and cook for 2 minutes more or until wings are crispy and cooked through. 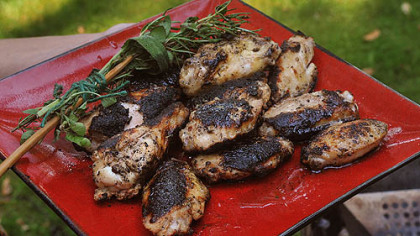 Remove chicken from grill and carefully open basket, teasing out any pieces that have stuck. Transfer to platter, sprinkle with chives and salt, and serve. Combine 1/4 cup sea or kosher salt, 3 cups water, 2 cups apple juice, 10 peeled and crushed garlic cloves and 1 tablespoon coarsely ground black pepper in a medium saucepan and bring to a boil over high heat. Transfer to a bowl or other container and allow to cool, then refrigerate overnight before using.